The poet steps away from Grendel, Beowulf, and the assembly at Heorot to mediate briefly, but deeply, on death. To cap off the section of the poem that’s primarily about Beowulf fighting Grendel, the poet meditates on death. I think this section is here for a few reasons. Chief among these reasons is all of the death that Grendel caused. This passage shows that those deaths aren’t necessarily something to mourn for too long. After all, there’s an inevitability to death, since all people come to it in their ends. But also presented is the idea that death is rest, that after the feast that, in this metaphor I think is life, the souls of the dead are sent to rest. So death puts those in its care to rest. There’s also the obvious reason of this passage: Grendel is, at this point in time, bleeding out somewhere in the fen. His death, too, is inevitable. Even after a 12 year reign of terror, there’s an end to it. There’s change to be had, and perhaps it’s not so much a matter of whether there will be change when your main meeting space is a place of terror and your mighty reputation is ruined, but a matter of whether or not you’ll be around to see it. Though even if it’s missed, at least, keeping with the poet’s metaphor, there is rest to be found in death. Then, the other, big picture sort of reason I think the poet meditates on death here is that Beowulf itself is a poem that always has death hanging over it. Not necessarily the death of central, or even named characters, but the death on the battlefield, or death in the family, or death as the end of all of the soldiers and monsters a figure like Beowulf has killed. The poem is drenched in blood and cloaked in death. So the poet’s meditation on the inevitability of death calls to mind that though Beowulf is victorious now, he too is ultimately heading to death. It’s a kind of reminder that he’s a mortal man, despite whatever divine favour – or even divine role – he may or may not have. There’s a lot to these few lines, but I’ll do what I can, picking at the bigger stuff in it. Namely the idea of death as a wave and the tangle of titles for humanity around the passage’s end. I think the poet describes death as a wave because in a world of seafarers and adventurers like the Anglo-Saxons, a wave is the perfect symbol of inevitability. On the sea, in a wind- or muscle-powered boat, there wouldn’t be much control to avoid waves that weren’t seen well in advance. Besides that, in a truly stormy sea – or even in just a choppy one – slowly avoiding one wave would probably just leave your vessel facing another one. So being hit by waves while on the sea would be seen as inevitable. Add to that the use of a lone sailor out on the sea as a metaphor for exile (in the poem The Seafarer), and there’s something to be said for the Anglo-Saxons associating ships with people, or more accurately (I think) bodies. So saying that death is an inevitable wave fits into the imagination of the Anglo-Saxon world quite nicely, I think. 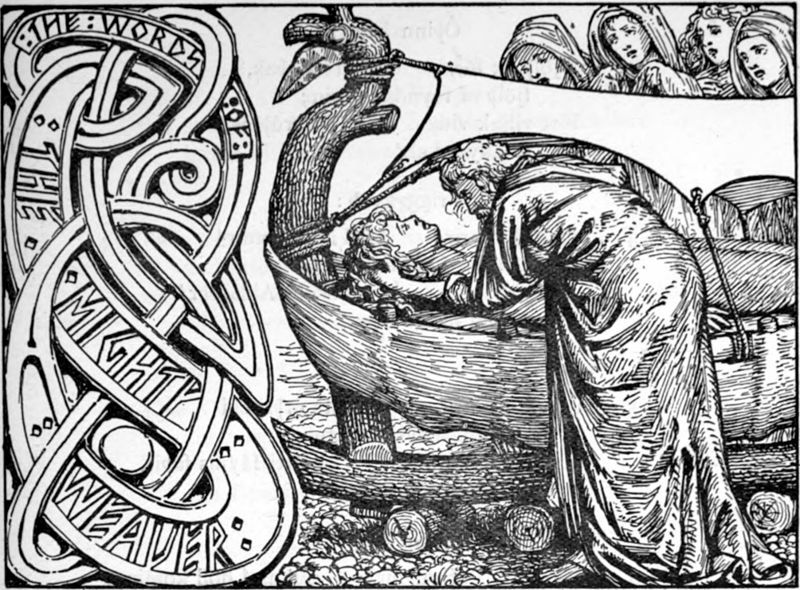 Related to the idea that the Anglo-Saxons used boats or other vessels as metaphors for bodies, is the word “sawl-berendra” (l.1004), meaning, literally, “soul bearer,” but taken to simply mean “human being.” So it’s safe to say that the Anglo-Saxons had a sense of the soul being separate from the body. “So what?” you may well ask. Well, I think the flurry of human epithets in this passage is meant as a reminder of mortality. After all, the terms for humanity go from literally “soul-bearer” to noting how people are beings of need and desire (unlike classical ideas of angels, beings without need or want, kind of like pre-robot robots), then “the sons of men,” putting emphasis on humanity’s being a bunch that reproduce themselves, nesting themselves deep into the body, then, finally, “earth-dwellers,” making it clear that these people are bound to the earth, they walk on the ground. So on the one hand, this cluster of terms for humanity could just be a poetic burst, but there’s also a descending order to it. You could even say that this whole passage works its way from a high concept of death as a wave and a high concept of people as “soul-bearers” down to the very basic ideas that humans are things that walk the earth and death is the big sleep. What do you think about the idea of death as a wave? Does that imagery still hold up today, or are we (for the most part) too landlocked for it to work? What sort of meditation on a heavy philosophical topic would be complete without a cadre of compound words? Let’s get right into those the poet used here. First up is line 1004’s “sawl-berendra” meaning “human being.” This word literally means “soul bearer” and its constituent parts mean the same – “sawl” is Old English for “soul,” “life,” “spirit,” or “living being” and “berendra” means “bearer,” or “carrier” in the language. Now, normally a straightforward compound is a straightforward compound. But here it seems like the plainness of this combination helps strengthen its literal meaning. It’s just a clean descriptor of a concept that cleanly splits the soul and the body in two, making for the foundation of a whole school of thought. Line 1006’s “grund-buend” isn’t quite so exciting. The word’s mix of “grund” (“ground,” “bottom,” “foundation,” “abyss,” “hell,” “plain,” “country,” “land,” “earth,” “sea,” or “water”) and buend (“dweller,” or “inhabitant”) gives us “earth-dweller” pretty readily. It’s curious how “sea” and “water” are part of this word that has so many connotations of solid ground or foundation . But I think that’s supposed to signal that the aquatic sense of the word doesn’t necessarily mean a body of water. Instead I think those sense of the word refer to water as a fundamental thing, as something essential to life – maybe even as a reference to the primordial waters in the Biblical creation story. But put even that sense of “grund” together with “buend” and you just get the sense that it refers to “dwellers in creation.” Still not very exciting, right? Thankfully, the word “lic-homa” (found on line 1007) is weird. So with a literal combination like “body house” or “body estate” you’d think that you’d get a word meaning something like “graveyard” or “corpse dwelling” y’know, somewhere that’s a home to corpses. Instead, we just get “body,” “corpse,” or “trunk.” But I think, if this is an intensifying kind of compound, that “lic-homa” has connotations of referring to the bodily portion of a living person, that is, to a corpse that has the energy and liveliness of a “village” or a “home.” Or, at the least, that this intensified version of “body” refers to the body of a dearly departed person. So maybe there’s not an inherent vibrancy, but there’s at least some life in the body this word refers to. Capping of this passage’s compound words is line 1007’s “leger-bedde.” This word mixes “leger” (“lying,” “illness,” “lair,” “couch,” “bed,” or “grave”) and “bedde” (“bed,” “couch,” “resting-place,” “garden-bed,” or “plot”) to mean “bed,” “sick bed,” or “grave.” Not too surprising. Nor is there much room for interpretations to wiggle with this word. Though I guess you could say that the death subtext is baked into it since a “garden-bed” or a “plot” could make for a good spot for a “grave.” Though when I hear the word I think of a slab more than a bed, the sort of thing sacrifices might be laid on. Or monstrous but dead sons – but that’s not going to come up for another few hundred lines. What do you think of the idea that we as humans are a combination of body and spirit/soul/mind/self? Is it a solid notion, or is it more accurate to think of ourselves as more of a singular being that just happens to have a mental/spiritual manifestation and a physical one somehow working in harmony? Does thinking of ourselves as a distinct and separate body and spirit/mind make death easier to think about or deal with? In the next passage, the poet sets us up for more good times in Heorot, though some of the sparkle of history is put into the air. This entry was posted in Beowulf, Old English, poetry, translation and tagged Anglo-Saxon, Beowulf, death, Grendel, speculation by NSCZach. Bookmark the permalink.